This book provides information and resources to assist in all stages of a client' s implant program, building on a transdisciplinary model of practice. It includes material covering a wide variety of topics including assessment, switch-on, client focused auditory rehabilitation, techniques for telephone training, communication therapy for social interactions, speech-language therapy intervention and psychosocial aspects of implant work. This is a practical text, and should appeal to a range of professionals new to cochlear implants including audiologists, hearing therapists and psychologists while providing the experienced clinician with new insights and fresh materials. The text' s structure makes it ideal as a training tool for students. Karen Pedley and Ellen Giles are the authors of Adult Cochlear Implant Rehabilitation, published by Wiley. Chapter 1 Inhtroduction: towards a more holistic and transdiciplinary model of rehabilitation, Anthony Hogan. Chapter 2 The assessment of adult cochlear implant candidates, Karen Pedley and Ellen Giles. Chapter 3 The 'switch-on' period, Karen Pedley and Ellen Giles. Chapter 4 Aural rehabilitation following cochlear implantation: key objectives of an aural rehabilitation programme, Karen Pedley and Ellen Giles. Chapter 5 Aural rehabilitation following cochlear implantation: a staged approach to auditory training, Karen Pedley and Ellen Giles. 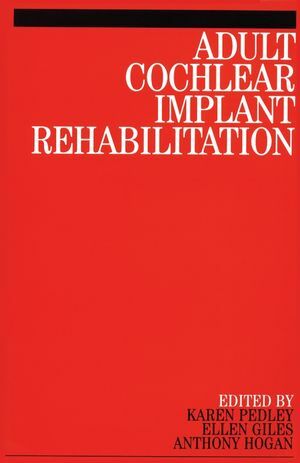 Chapter 6 Aural rehabilitation following cochlear implantation: forming an intervention plan, Karen Pedley and Ellen Giles. Chapter 7 Social-interactional elements of communication therapy for adult cochlear implant recipients, Christopher Lind and Lisa Dyer. Chapter 8 Speech and language therapy in the rehabilitation of an adult with a cochlear implant, Susan Hamrouge and Sarah Worsfold. Chapter 9 Integrating psychosocial aspects of rehabilitation in your programme, Anthony Hogan with Andrea Lynch. Chapter 10 Telephone training with a cochlear implant, Ellen Giles. Chapter 11 Practical aspects of cochlear implant use, Ellen Giles.